Built as a summer house to accommodate a large extended family, the house was conceived of as a set of interconnected weathered timber clad pavilions, linked by casual living spaces, wrapping a protected north-east facing courtyard. Sited on an exposed sandy spit on Pittwater, on the lower reaches of the Hawkesbury River estuary, to Sydney’s north, the house at once absorbs the panoramic views to the south-west, and turns its back on the often chilling breezes that sweep across that body of water. The protected courtyard is afforded water views via opposing sliding glass doors of the casual living room. Individual families within the larger clan are able to retreat to discreet sleeping rooms in each pavilion. 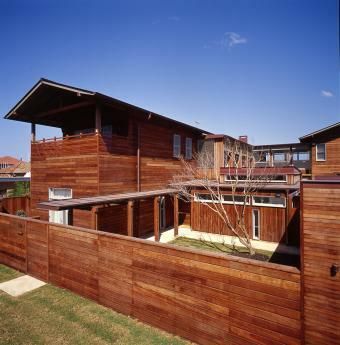 The naturally weathered timber cladding (made from a species known as Kwila, a Forest Stewardship Council accredited hardwood) is set 40mm off the face of the building, with open joints, acting as a rain & sun screen – a technique pioneered by award winning Queensland architect Gerard Murtagh – affording the building a remarkably moderate temperature through summer and winter.